^ Soltam K5 and K6 120 mm light mortars (Israel), Mortars. Jane's. [2012-07-12]. ^ Pike, John. 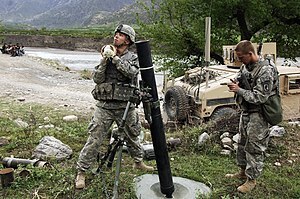 XM929/XM929E1 120mm Mortar Smoke (White Phosphorus) Cartridge. www.globalsecurity.org. [2018-01-08]. ^ Pike, John. XM930 120mm Illuminating Cartridge. www.globalsecurity.org. [2018-01-08]. ^ Pike, John. XM931 120mm Full Range Training Cartridge (FRTC). www.globalsecurity.org. [2018-01-08]. ^ Pike, John. M933/M934 120mm HE Cartridge. [2018-01-08]. ^ Pike, John. M971 120mm DPICM Mortar Cartridge. [2018-01-08]. ^ Pike, John. XM983 120mm Infrared (IR) Illuminating Cartridge. [2018-01-08]. ^ Pike, John. M984 120 mm Extended Range DPICM Mortar Cartridge. [2018-01-08].